I am interested in making paintings, drawings and reliefs that refer and reflect back onto themselves and echo the shape, surface, materiality and or the innate characteristics in which they are formed. My approach to painting is a very intuitive one. 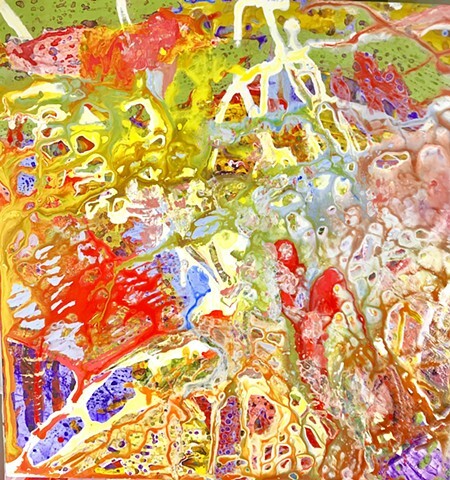 My process is an active and physical involvement with using paint as a fluid vehicle to create structure and meaning. I develop many different surfaces, translucent, transparent, opaque and dense, that are composed from using the medium in a multitude of ways. Each work has a specific visual or tactile dynamic that congeals within a fixed moment in time. I often spend weeks working on a composition, overlapping, layering, erasing, adding and accumulating surfaces and color in order to represent the inherent relationships of one work clearly. My decision making during this process dictates the vocabulary and content of the painting.